From the ancient Greek for "lack of blood," a decrease of red blood cells in the body, leading to a lack of oxygen in organs. Summary: It seems like everyone is susceptible to a cold, flu, or scratchy throat from time to time. Discover how fruits, vegetables, and herbs work wonders to treat and prevent these common illnesses. Mix well with apricot nectar and rosehip tea and drink slowly in small sips. Cabbage juice can aid in the healing of throat maladies. Gargle cabbage juice to relieve a sore throats, or drink cabbage juice mixed with honey to prevent losing your voice. Eucalyptus oil is an excellent remedy for a variety of ailments. 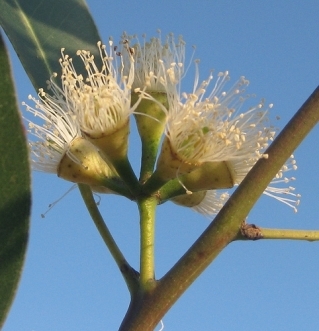 V-VAX essential oil is made from the purest double-distilled eucalyptus. There are approximately 730 varieties of eucalyptus trees, and only eleven are rated "medicinal" by US standards. Of the eleven medicinal varieties, V-VAX is rated number one. Apply a warm compress to a congested chest for 10-15 minutes. Then, rub a generous amount of V-VAX eucalyptus oil onto the chest and let it absorb. Breathe deeply, thus allowing eucalyptus to enter deep into the lungs and break up congestion, making it easier to cough and expel mucus and phlegm. Create a cough remedy with juice of two lemons, equal amounts of pure honey and a slice of onion, and three drops of V-VAX eucalyptus oil. Stir well and take one teaspoon up to six times daily as needed. Or, mix equal parts V-VAX with baby oil or petroleum jelly and gently massage the chest, neck and back, or under nose. To treat a head cold or flu, pour 15-20 drops of V-VAX into a bowl of steaming hot water. Cover your head with a towel and inhale the vapors. A personal steam vaporizer inhaler can also be used with smaller amounts of V-VAX and water. Sprinkle a few drops of V-VAX oil onto a handkerchief and inhale to help clear clogged nasal passages, or garge with warm salt water and a drop or two of V-VAX to ease a sore throat. Whether in dried form or as ripe fruit, figs not only taste great but they are one of the highest plant sources of calcium and fiber. The idea which you hold, that no remedies should be used for the sick, is an error. God does not heal the sick without the aid of the means of healing which lie within the reach of man; or when men refuse to be benefited by the simple remedies that God has provided in pure air and water. When the Lord told Hezekiah that He would spare his life for fifteen years, and as a sign that He would fulfill His promise, caused the sun to go back ten degrees, why did He not put His direct, restoring power upon the King? He told him to apply a bunch of figs to His sore, and that natural remedy, blessed by God, healed him. The God of nature directs the human agent to use natural remedies now (Selected Messages Volume 2, 286-287). Fig juice made from soaked figs relieves coughs and sore throats. Use grapefruit seed extract to treat sinusitis and Strep throat. Nutribiotic grapefruit seed extract contains Citricidal®, a natural extract of citrus used by many health care professionals to treat internal and external ailments. Grapefruit is high in vitamin C, which is an immune system strengthener. Grapefruit also aids the body in eliminating poisons. The rind of the grapefruit is a natural source of quinine. Orange is high in vitamins A and C. It also contains high amounts of potassium and a good amount of calcium and phosphorus. Known to decrease excess mucus from the head and nose. Useful in cases of respiratory ailments, such as bronchitis, pneumonia, asthma, high blood pressure, and rheumatism. Lemon contains vitamins B and C, calcium, iron, potassium, and phosphorus. A natural antiseptic, lemon is helpful in destroying harmful bacteria in areas of infection. 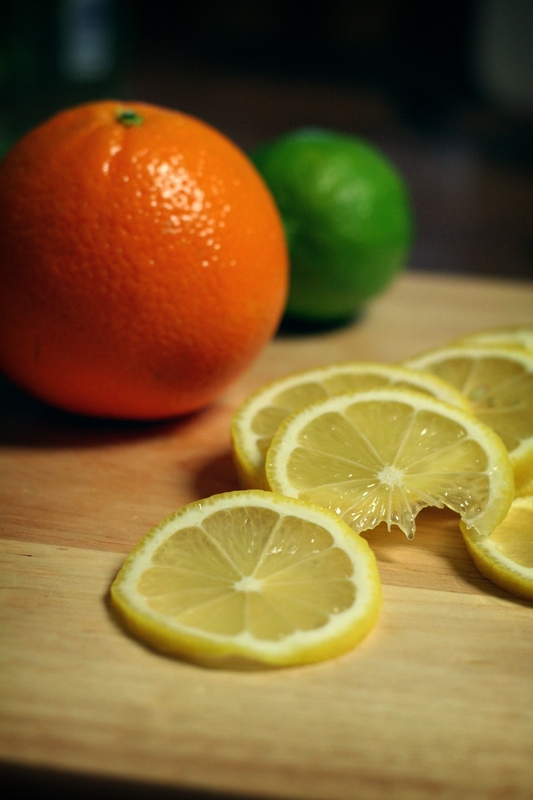 Because of its vitamin C content, it again acts as an immune system builder and is very beneficial to the liver. Lemon also forms alkaline in the body. Garlic contains vitamins B and C, calcium, potassium, and phosphorus. Garlic is one of the most beneficial foods for the digestive system and has a positive effect on the lymph, helping elimminate toxic waste from the body. It also cleans the blood. It is a natural antibody and therefore very valuable in strengthening the immune system. Onion contains vitamin A, thiamine, iron, niacin, and calcium. Onion has antiseptic qualities: it helps drain mucus from the sinus cavities and loosen phlegm. It also destroys worms and other parasites in the body, and helps heal asthma, bronchitis, pneumonia, flu, and colds. Peppermint Oil brings oxygen into the bloodstream. It cleanses and strengthens the entire body. Cut fruit and onion into pieces. Blend well. Add a little bit of water if necessary. Can be used effectively for colds, flu, sore throat, infections, respiratory problems, and a general immune system strengthener. Adults: take one cup a day. Children: take 1/2 cup a day. This amount is to be taken periodically throughout the day, one spoonful at a time. Refrigerate any leftovers in a glass jar. Warm slightly in a saucepan before serving. To soothe a sore throat, make a compress by placing hot, mashed, unpeeled, boiled potatoes in a linen or cotton cloth, and then apply to affected area. 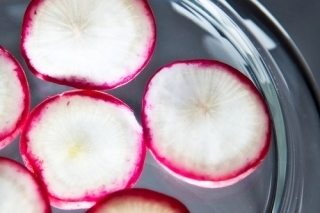 Serve crisp radishes as an appetizer for sickly children, or those who suffer from anemia. Put older radishes through a juicer with a little carrot juice, or sprinkle radish slices on top of soup. Since the mucous tissues of the throat and lungs are especially susceptible to the sting of radish, it can be very useful against respiratory infections. You will find a host of cough syrups at the pharmacists which have radish for their base. The natives in Siberia have concocted a mixture, consisting of one par juice of radish to two parts honey. A tablespoon of this mixture before every meal and at bedtime soon clears away phlegm and relieves a sore throat. Some forms of stubborn asthma can be relieved by a homemade horseradish preparation. Make in small amounts as it is better fresh. Grate a piece of horseradish as fine as possible, mix it with lemon juice and take this by the teaspoonful several times a day, between meals. It will bring tears to your eyes, but the burning sensation as it goes down your throat is proof of its potency. Homemade horseradish is not recommended for delicate stomachs or those with hemorrhoids or other inflammations. Colds, sore throats, and the flu can be treated with a serving of sage oil. i. Healing Edibles & Other Home Remedies, Mara Ministries.